The cast for The Amazing Race 31 was added to all of the simulators. This season features many competitors from other reality television shows. Please report if you see any bugs. Additionally, BrantSteele.com had a security update with the addition of SSL. This should reduce the warnings that web browsers generate for websites without it. The only errors you should see now are custom seasons where you used your own images that don’t include ‘https’ at the start. A way to handle these images is being looked into. If this test goes well, BrantSteele.net will likely be updated with SSL in May. One important detail is that users of all the simulators must be at least 13 years of age or have parental consent. Another change is that manual recovery of deleted saved simulations will be ending. Along with the privacy benefits of ending this practice, this is the most time consuming maintenance task and takes time away from designing and updating the simulators. If you have a saved simulation you would like to have recovered, you must send the simulator, season (if applicable), and the saved code using the Contact Form before July 15th. Because saved simulations are now encrypted, simulations can no longer be recovered by contents. Requests submitted before this date will be recovered, if possible, on July 15th or shortly after. Saved simulations will be cleared 3 months after the last view or 1 year after the last view if the ‘keep longer’ or ‘keep forever’ option is selected. Saved simulation recovery is ending, and no exceptions will be made after this date. The next simulator, Celebrity Big Brother US, is still in development. Cast photos for the new houseguests revealed today for Big Brother 20 have been added to all of the simulators. The maintenance is almost completed. There will be an announcement with new save season removal and data privacy policies posted in the near future. Two issues with the disk have worsened this past week, so the 3rd maintenance period of the year will begin (and hopefully end) this weekend to fully resolve them. The first issue began near the end of January and occurred on the same drive where active simulator sessions are saved. It likely impacted simulator performance across both BrantSteele.com and BrantSteele.net and may have led to more frequent resets. I identified the source of the error in the logs. I’ve been monitoring the second issue for the past several years. A storage drive, different from the main drive, is filling due to the accumulation of saved seasons on the BrantSteele.net simulators. Under certain criteria, saved simulations that have not been recently viewed are regularly backed up to an external drive and removed from the server. Upon user request, I can recover these seasons for them. 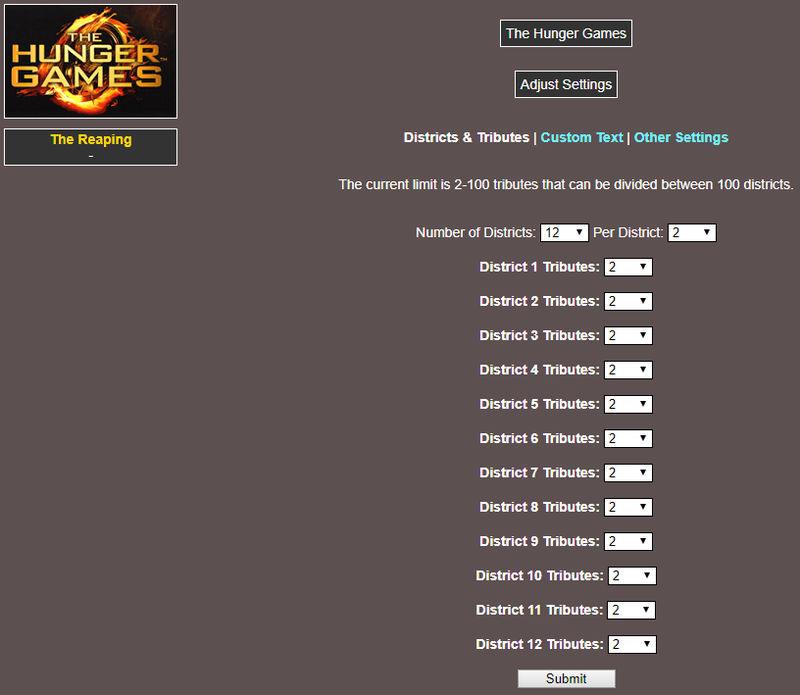 The more simulations are saved, the longer this has been taking, so I have been doing this less frequently. Part of this maintenance will involve coming up with a better structure to inform users if and when the simulation was deleted to assist with the recovery process. The other part of the maintenance involves finally releasing an updated internal structure for the Hunger Games Simulator to reduce the size of saved season since that is the most commonly used simulator. My goal is to do this without any downtime or noticeable differences to the Hunger Games Simulator itself – just a brief period of time where saving/loading is unavailable. Without these changes, the storage drive will fill before the end of the year and saving simulations will no longer be possible under the current removal criteria. I hope that after these changes go into effect, I will only have to do save season removals once or twice per year and can further relax the removal criteria. ALL MAINTENANCE HAS BEEN COMPLETED! For those of you interested in the next simulator, it will be the Celebrity Big Brother US Simulator. It’s been in development for the past few months and is getting closer to being released. Estimated release dates for this and the other remaining Big Brother and Survivor simulators are not available, but more teasers will be posted as it gets closer to completion. A significant structural update was completed for the .com server and uploaded on Sunday morning. Adjustments were made to all of the simulators, the images, and other files that should make it easier to maintain and update simulators in the future. Most of the changes were intended to be behind-the-scenes, but some changes to the Edit Cast pages should be noticeable. Unfortunately, this update caused some bugs, and I may not be aware of all of them. Please report any issues you notice, and I will work on addressing these as soon as possible. – Ghost Island logo is incorrect. – Various color and black & white cast photos stopped working. – Alliances no longer work in the Big Brother Canada 5, Big Brother Over the Top, Survivor 33, Survivor 34, Total Drama Island, and The Challenge: The Duel simulators. 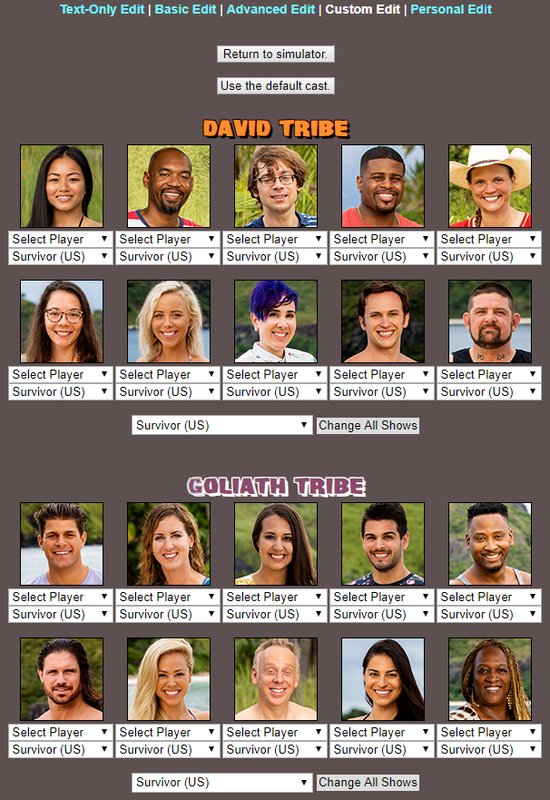 – Merge tribes and tribes added after the start of a season no longer show on Edit Cast for S33 & S34. 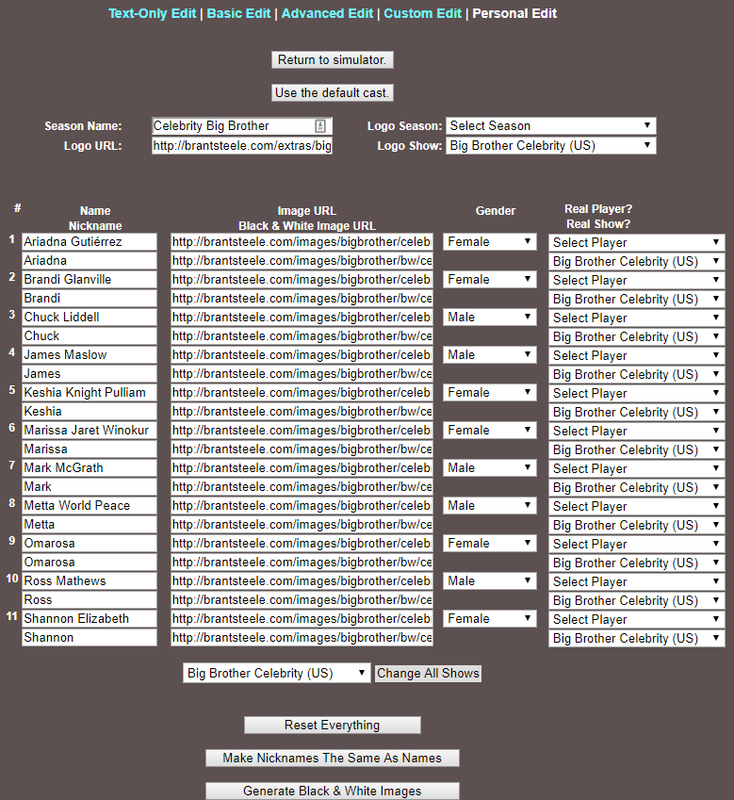 – Big Brother 10-20 Player Templates link no longer working. – Big Brother Canada 5: The winner page redirects to the start. Thank you for your feedback. Comments have been turned off. Please feel free to use the Contact Form for additional bug reports. I have renewed the BrantSteele.com and BrantSteele.net servers and domains for the upcoming year. Although I haven’t had much time to develop simulators in recent months, I would like the ones already made to still be accessible. The simulator for Big Brother 19 is delayed, and the next planned simulator is Survivor 35. This season, and all future simulators, will be designed using the new .com structure. The .net structure can’t handle the complexity of twists in the latest seasons. Recently, a bug with Random Cast was fixed where specific choices for cast members were using photos from the incorrect seasons. A change in Edit Cast is coming where Text-Only Edit and Basic Edit will provide lists of logos for that show. Advanced Edit will allow logos from all shows. An estimate is not yet available, but I plan to work on this during my free time over the holidays. Thank you to everyone for your patience waiting for new updates. I would like to remind you that the best way to contact me is through the Contact Form. I check this daily, and I added automated server jobs that run every minute to check for the most common server issues and perform the steps needed to fix them. The BrantSteele Subreddit and Twitter are not currently being maintained.